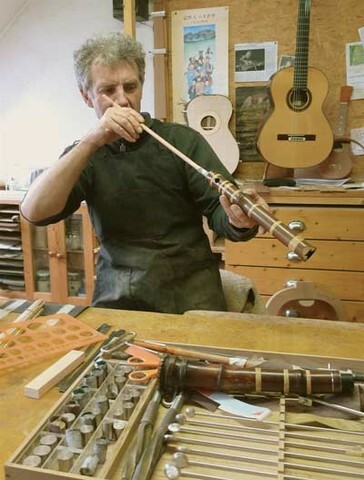 Jean-Marie Fouilleul is a guitar maker and discovered the shakuhachi in 1996. He started to learn it with the French teacher Véronique Piron (KSK). He also followed several masterclasses in France and in Japan with Gunnar Jinmei Linder and deepened his knowledge and practice with Daniel Seisoku Lifermann (Dai shihan of the Hijiri school). He has been following the teaching of Fukuda Teruhisa, founder of the Hijiri school, for several years. In 2009, he followed a course in Tokyo with John Kaizan Neptune to learn how to make a Jinashi shakuhachi. Ever since, he has been improving his knowledge and mastering of shakuhachi making in order to make Jiari shakuhachi according to the Japanese tradition. In 2018, he was awarded the shihan license by Teruhisa Fukuda with the name SeiJu (Sacred wood).